Repairs to the Tractor down on the Farm! 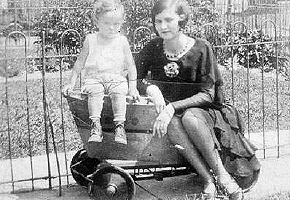 A modest number of lucky individuals can remember having a pedal car as a child or playing with one at a friend's house. "Pedal Car" usually refers to a child's toy vehicle with pedals, wheels, tyres, axles, body and steering assembly. 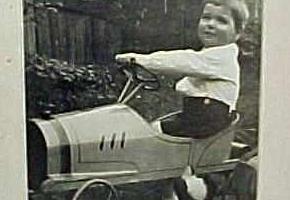 Pedal cars were designed for heavy play outdoors. 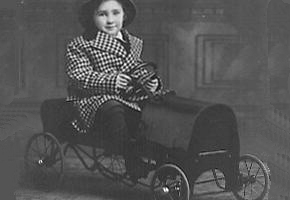 Mostly geared for children two to six years of age, most of the early examples were "kart" style cars made from discards such as old crates, pallets and wagon wheels. Even an old dustbin or washtub could be used as a makeshift body. Tin can headlights made a good finishing touch. 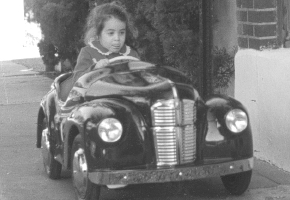 It didn’t take long after the rise of the automobile for kids to take to the sidewalks in cars of their own. In the 1890s the first pedal cars were scratch-built from parts found around the barn, much like automobiles themselves. As the car became a plaything of the rich by the turn of the century, so too the pedal car became an exquisite, commercially built toy. Sheet steel covered the car’s wood frame, and full-size carriage lights, starting cranks, and license plates furnished the trim. 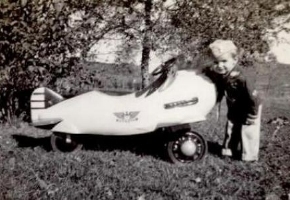 Eventually pedal cars became recognizable as certain makers, like Buick, Pierce-Arrow, and Winton. 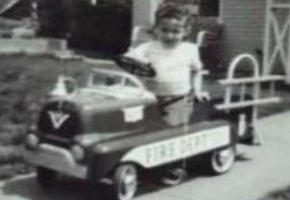 The postwar prosperity of the 1950s brought a brand-new automobile to every driveway in United States, and the newly affordable, all-metal pedal car became the baby boom generation’s first set of wheels at the same time. 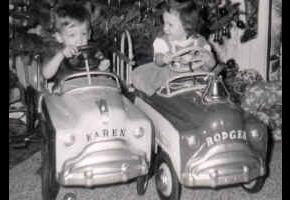 Through the 1954 Sears, Roebuck and Co. catalog, you could buy a chain-drive Garton Kidillac Deluxe with battery-powered head- and tail-lights for $36.95, or a pedal-and-rod-drive Champion sports car from Murray Ohio for $11.98. 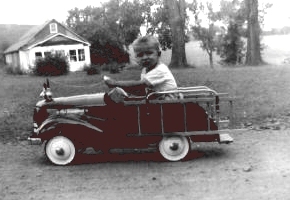 Pedal cars were such an icon of popular culture that they were widely featured in advertising. 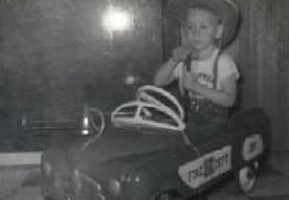 The Garton Kidillac was even given away as a premium to buyers of new Cadillacs. A declining birth rate, high inflation, and the plastic Marx Big Wheel tricycle all arrived in the early 1970s, and pedal cars were never the same. 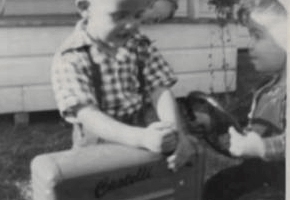 Murray Ohio stopped making pedal cars altogether and began manufacturing the newly popular power lawn mower. The introduction of Rubbermaid’s incredibly durable, all-plastic Little Tikes Cozy Coupe in 1979 (still in production) sealed the fate of the all-metal, old-style pedal car.